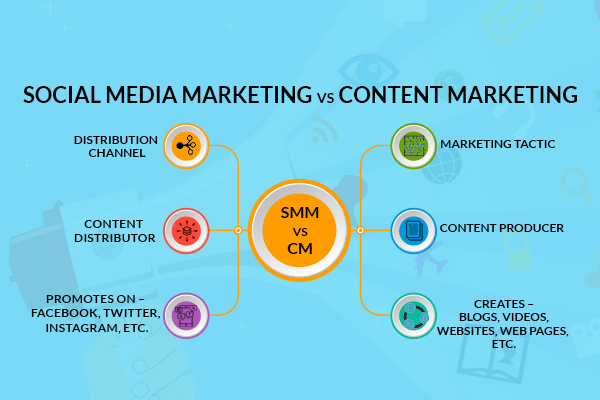 What is the difference between social media marketing & content marketing? Many people tend to get confused between content marketing and social media marketing. They think both are the same which is not true. However, the two are different and are a part of internet marketing. Internet marketing is a vital component of digital marketing. The primary difference is both are two distinct tools used by digital marketers for online promotion of the brands. Social media marketing in simple terms is a process of promoting product or service on social media platforms through various ads or content formats. Social media marketing aims to promote brand, reach more people increase sale and increase followers. It is a channel that extends the reach of content marketing with push strategy. Social media marketing can be used for both online and offline business. Social media marketing helps increase brand awareness, reach more customers, stay ahead of competition, engage with customers, stay updated with latest marketing trends, keep customers informed about the latest changes and developments in the new product and develop loyal customers. Most marketers focus on conversations and business-related sharing without solely focusing on promotions. Brands ensure creating and sharing content to encourage strong customer relationship management. It also helps small businesses to create brand awareness on a large scale. Content marketing focuses on creating, curating and distributing the relevant and valuable content consistently. It aims at attracting and retaining its clearly defined audience and profitable customers by providing information that interests customers. It helps share information, educate, inspire as well as entertain both the existing as well as the potential customers. It aims at promoting product or service through brand awareness and reshaping consumer attitude. Providing useful information and content to audience helps drive their behavioural change. Several organizations publish content on the websites, via traditional channels, social channels as well as through other channels of marketing. Content marketing helps create a brand image as a thought leader who adds value and drives the target market. It plays a significant role in building brand image and building trust among customers. It is mainly used by marketers to establish trust, credibility, and loyalty among customers. Promotes on – Facebook, Twitter, Instagram, etc. Creates – Blogs, Videos, Websites, Web pages, etc. Content marketing and social media marketing both are different. However, they have some overlapping characteristics. Integrating the two is the best way of marketing and promoting the blogs, business and brand. Social media marketing acts as a great support to content marketing for publishing content on mediums where the brands can easily reach target audience.